One of the saddest times of the year for me personally is the end of the growing season. The waning strength of the plants and the gradual disappearance of the bees and butterflies is a little depressing. However, there are still quite a few plants that are still growing, and some, such as fall Chrysanthemums, are just beginning to burst with color. Others, such as Maypop Passionflower, are now bearing ripe, tasty fruit. Many folks are in the process of putting up preserves and canning. Unfortunately, those are not areas in which I am well versed. For me, this time just before the killing frost is when I collect cuttings to set new plants. I begin with the tender plants that are not likely to survive the winter. Among them are Lemon Verbena, Lemongrass, Gotu Kola, and Holy Basil. I also take cuttings from herbs that I use frequently, whether medicinally, ceremonially or in Braucherei. Among those are Marjoram, Elder, Horehound, Dotted Mint, Hyssop, Lemon Balm, and Southernwood. I will be adding more until the Frost Giants overtake the gardens. Some of these cuttings are to produce plants to go in the spring to the Lüsch-Müsselman Graabhof, where I plan to put down larger herb gardens in honor of the ancestors. Others may be dispersed to family, friends, or kinfolk to help to bolster their gardens. Many sites, such as Mother Earth Living, have articles advising how to root cuttings in water or in soil. I generally use rain water, but I have successfully rooted quite a few plants in the soil, particularly when using a tea made of Willow or Meadowsweet to aid in the root growth. The water, though, is easier for me at this time of year. I do have a greenhouse window with a grow light, but the space is small for the number of plants I am planning to grow. When their roots get large enough, I will transplant them into pots. 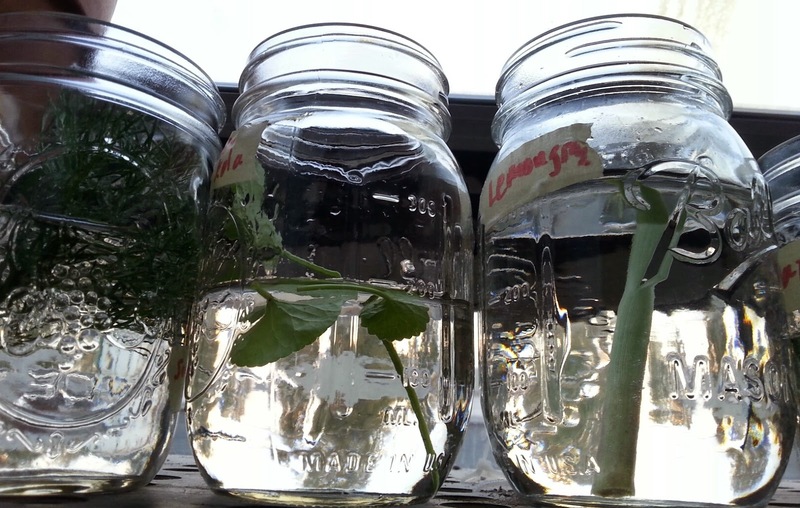 I encourage folks to try expanding their access to plants or to their gardens by using cuttings. Spiritually speaking, it is a rewarding and meaningful way of honoring your plants. Practically speaking, it can save you money on purchasing year after year the plants that are tender in your hardiness zone.